Captain George Graham Sinclair, Royal Regiment of Canada, R.C.I.C., 35 years old, Class of 1933, Buried at the Dieppe Canadian War Cemetery, Hautot-Sur-Mer, France. Son of Lorne M. and Evelyn M. Sinclair, of Toronto, Ontario; husband of Dorothy Flavelle Sinclair, of Toronto. Captain Sinclair received his B.A. from the University of Toronto, and graduated from Osgoode Hall in 1933. He was killed in the Dieppe Raid on August 14, 1942. 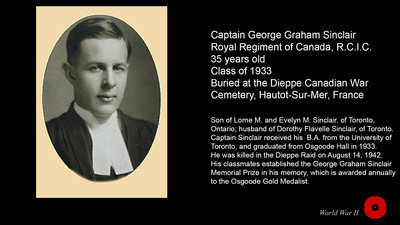 His classmates established the George Graham Sinclair Memorial Prize in his memory, which is awarded annually to the Osgoode Gold Medalist.